Very nice classy watch. I wear it everyday to work. Etc. A mix of smooth and textured matte blue silicone teams up with high-polish silver metal to give you high performance, timekeeping versatility and a distinctive look. Useful as an easy way to display your team colors and a fine timepiece to bring from work to recreation without missing a beat, this watch is bursting with athletic character. Luminescent hands and matching markers keep you on time even at night. 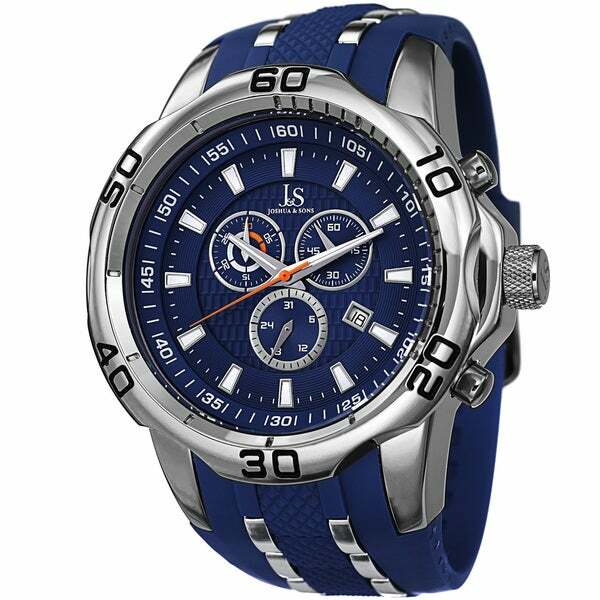 Joshua and Sons produce great timekeepers at an affordable price. They rival $300+ watches with modern style and comforabtility. Always accurate time and receive many compliments. Well constructed and substantial. The silver on the watch has faded off leaving it rusty like. It is sad that I threw money away on a watch that i cant wear. The worst part is I have only worn it for a few months. I purchased two of these watches actually in different colors. The band failed (broker in two) on both of them in less than 6 months. Regretfully I can not recommend this purchase. Didn't hold up to average everyday use. The band broke quickly & the inner workings were awful. It kept losing time. Trashed it & never again. Great buy! Heavy watch that makes a statement. Can be dressed up or down. Bought as a gift and love when I see him wearing it! The watch looked great when new. I wore it for 6 months and the finish started to wear off and I had to return it to Overstock. They refunded my investment. "I got my Husband a black one last Christmas the band broke the other day. He has not had it on very much. How can we replace the band?" If you still have the packaging there is a slip of paper about manufacturer inside. There is an address, phone number and website with how to proceed. The company does state that they are not responsible for band replacement in the warranty, however, you may be able a purchase a replacement band. "How to return a item from here"
You will be contacted by customer care who can assist you with your return. "I'm looking for one model watch that comes in Red Yellow and Blue." Hello Nic1434, we do not currently have this in red, yellow and blue. Thanks for shopping with us!